When I first drove my TANK 150 Sporty, I noticed quickly that the brake handles were not the same; one had a spherical knob on the end and the other did not. My initial assumption that something had been broken off proved erroneous. 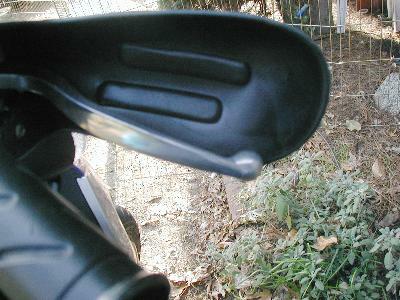 The brake handles were clearly of differing design. Now one could naturally come to the conclusion that Chinese manufacturing and construction simply suffers from inconsistency and erratic mismatching but it seemed that perhaps a more charitable interpretation was in order. It deserved some deeper speculation. The thought that it might be a deliberate effort to aid cretinous Americans (this is certainly the way we are regarded in China) in distinguishing right from left presented itself, but this solution seemed too obvious and simple. Perhaps a more thoroughly esoteric motivation underlay this anomaly. Switching from driving on the right to driving on the left can seem to be a simple mirror-image transformation, that is, until a sudden emergency arises and one attempts to evade oncoming traffic on the wrong side or to take a roundabout in the wrong direction. Clearly this is it! This is the reason for the knob on the right but not on the left brake handle: Stay on the side of the road with the knob. Go around the roundabout in the direction of the knob! 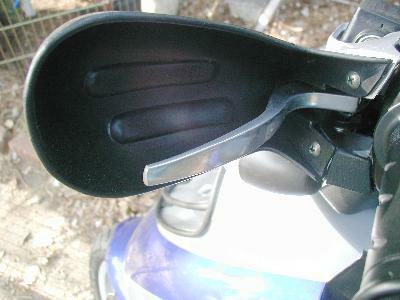 Then, to switch to driving in England, Japan, or Australia one need only swap brake handles to create a left-handed drive scooter. Well, perhaps this is a bit fanciful but it's a kinder and more interesting interpretation.